In Chinese martial culture there has long been a distinction between two heavy maces, the 鞭 ( biān ) and the 鐧 ( jiǎn ). The former always has a bamboo-sectioned blade, sometimes of round and sometimes of angular cross-section. The latter tends to have a smooth blade of angular (often square or rectangular) cross-section, sometimes with grooves. Dating: 19th century, possibly older. 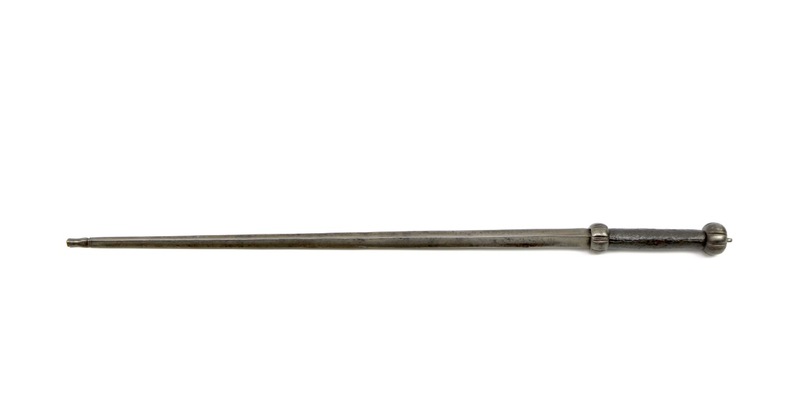 Here’s a pretty good example of a Chinese mace of the 鐧 type. It has a tapering blade, hollow ground on each side to make the edges slightly sharper. It terminated in an attractive finial. The handle is a thick iron tube, heavily patinated, that looks like it hasn’t been wrapped for a long time. The patina on the exposed handle is lovely and it provides good grip as it is, so perhaps the piece was just used like this. 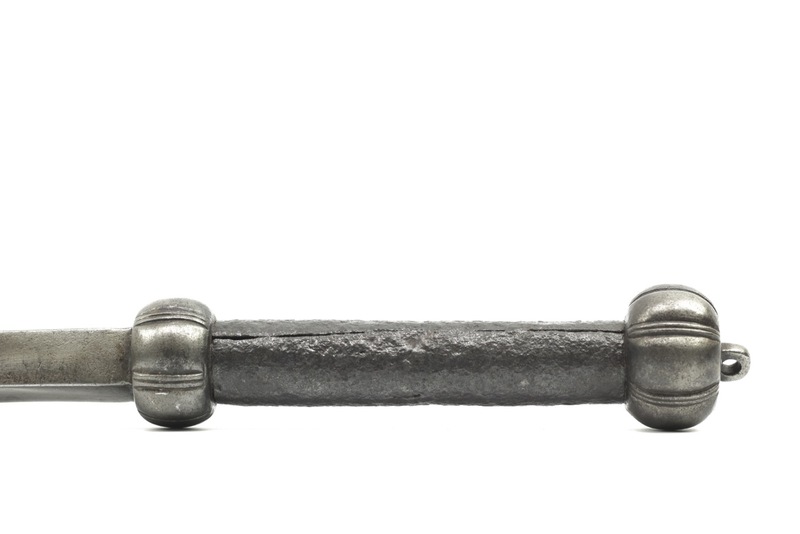 The handle sits between two solid iron flattened spheres with grooved decoration, serving as guard and pommel. 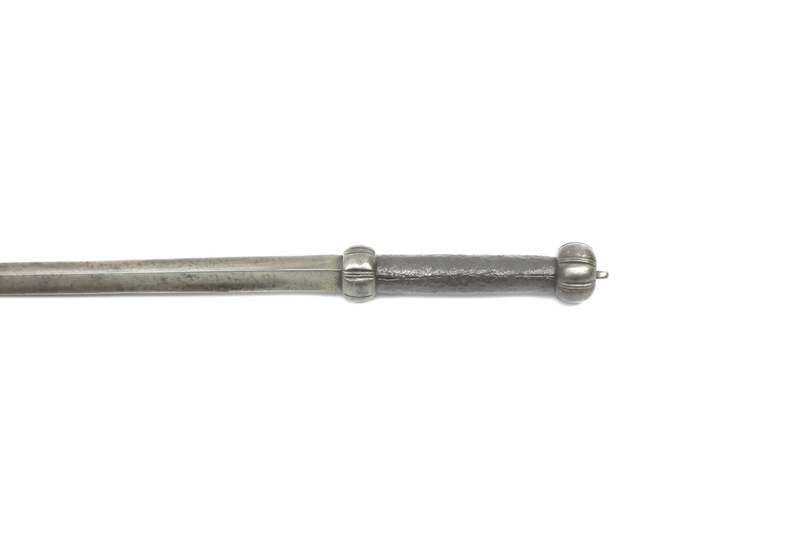 At the end of the pommel is a small loop for the attachment of tassel or lanyard. The somewhat similar maces that appear the Huangchao Liqi Tushi were used by the all-Han Green Standard Army. 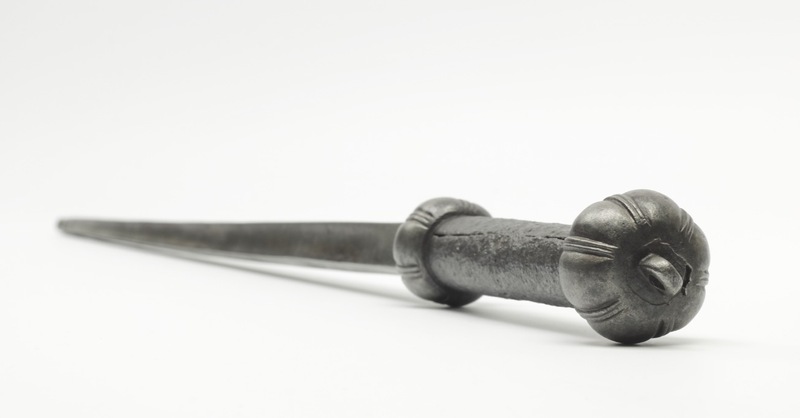 This army was often deployed in an internal peace keeping role, for which these maces were probably also used. It has a good size, weight and balance for heavy hitting yet quick handling. Ideal for non-lethal security purposes where one may run into those armed with lethal weapons that you need to take out, ideally rendering them harmless without killing them. These maces did not change shape much, if anything, over a long period of time so they are pretty hard to date. Judging from style, workmanship and patina my feeling is that it’s most likely from the late 19th century. This is a conservative guess, it may well be older and just very well preserved, which happens. Most of these on the market are of rather coarse, village grade manufacture. This is a rare example of a somewhat higher quality than most found on the market. 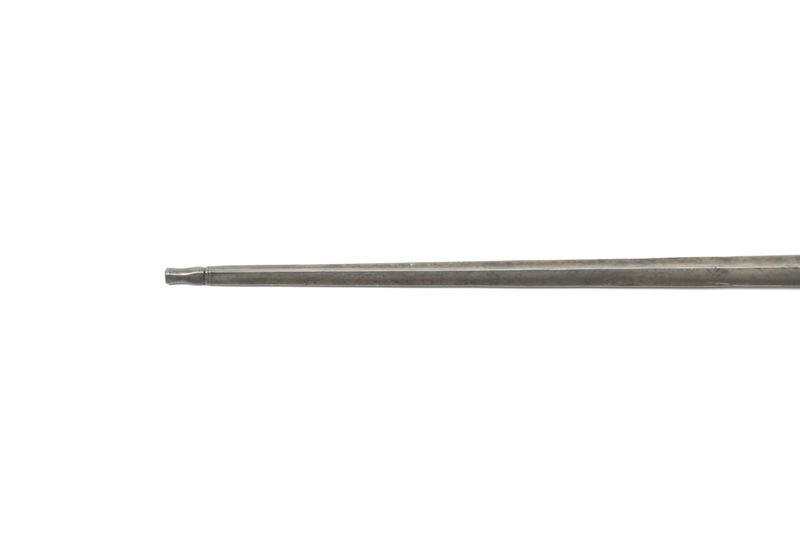 A nice example of a rare Chinese blunt weapon, the mace. Of good weight, size, and handling characteristics. These nimble weapons were probably used by soldiers and security personally that were in situations where one had to neutralize armed opponents while trying to avoid killing them. It is of better quality manufacture than most, with some attractive geometric details.